Custom Quality Colors is a tool for changing colors used to display the quality of items. 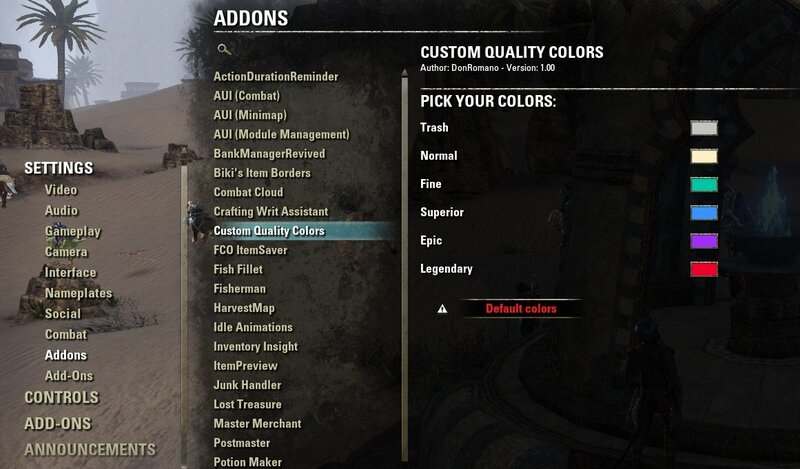 To change the colors go to Settings->Addons->Custom Quality Colors. New colors will be used on all the list and tooltips throughout the UI. This addon depends on LibStub and LibAddonMenu-2.0 - please, make sure you have them installed. The addon was requested (well, sort of) by Shadowshire - thank you! Tooltips hookup methods are based on functions used in Enchanted Quality addon written by Rhyono & votan. I installed the Tamriel Trade Centre addon but its tooltips weren't showing. After disabling/enabling all addons to track down the conflict I was left with this addon. Could you take a look to see what could be causing the conflict? Re: Thank you very much!! Thank you very much for your time and effort to make it easier for those of us who cannot reliably distinguish one particular color (such as green, in my case) from other colors (such as red, orange, and yellow)! Currently, I am still experimenting with the color for Fine quality, which is by default indistinguishable from Legendary (to me). But I am confident that I will find a satisfactory substitute. Nice idea, very helpful for people that have forms of color blindness. Or those that just don't like the default colors. As for tooltips, they are mostly populated by the client directly, not through lua so hooking it directly probably isn't possible. One possible idea would be to hook the tooltip and slightly alter the language string used to format the name. Check out https://www.esoui.com/downloads/info...edQuality.html for an example of what I mean. Yeah, I wonder why Zenimax guys haven't thought about people who need to change the color scheme. I mean, the quality information is very important and if you cannot see it, it's very annoying. Thank you for the info about the possibility of changing the name of the item on the tooltip - I'll look at this addon and maybe I'll manage to use the same method to change the colors.